Designed by Tristan Hall and published by Hall or nothing productions. 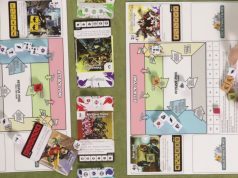 A historical player vs player game. 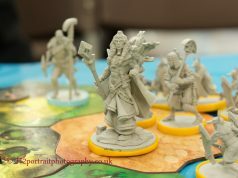 At Airecon 2018, I saw this game with beautiful artwork called “Gloom of Kilforth” and photographed the lay out for my blog. At the UKGE, later that year, I ran into Tristan again. 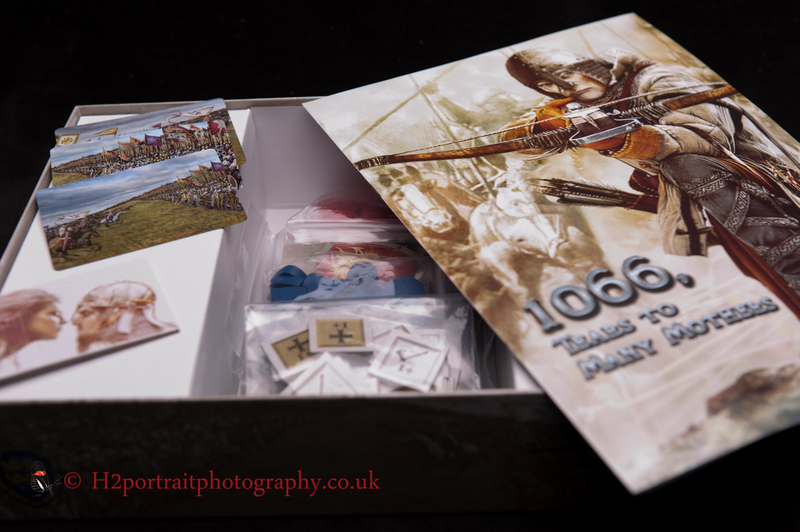 They were kind enough to take my business card and said they would send a copy of 1066 when it was printed and arrived in the UK. I think there is a lot of crossover with the art work even though Gloom of Kilforth is set in a fantasy realm. The insert of the box. The first player token is in the bottom left-hand corner. 1066 is player verses player game. (There is a solo version of the game, but we will not be covering that). You are either Harold or William. Both of you are trying to make their way to Hastings to fight a battle. Harold has to fight off Viking invaders beforehand then trek down to the south coast. 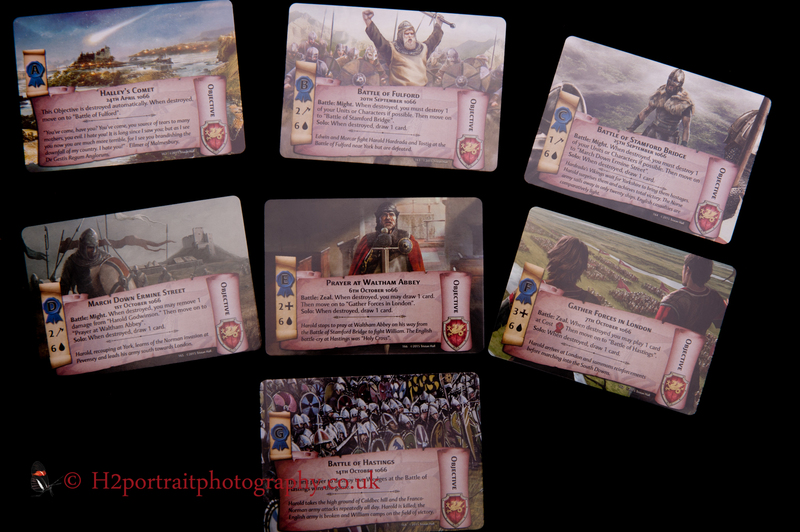 William has to seek Papal blessing before mustering his own army to travel across the Channel to face his enemy. Players have a hand of cards (over seventy) that are played in front of them on a three-by-three grid. 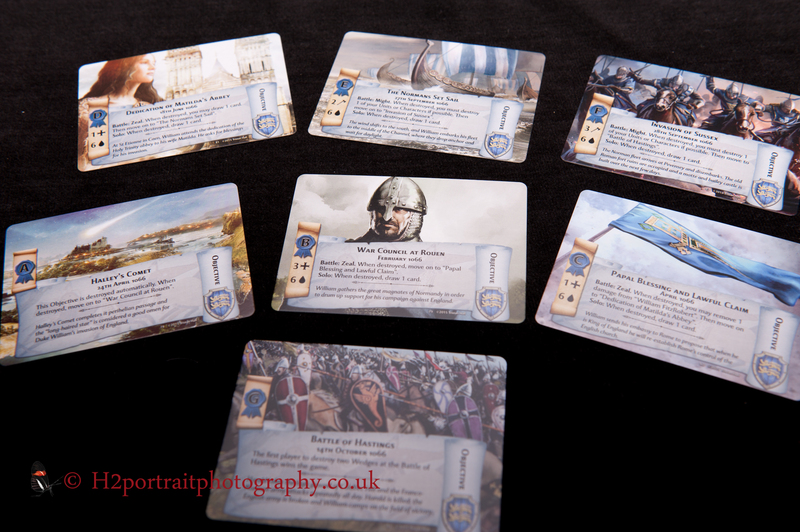 In between them are three cards with images of the field of battle. These cards are called ‘wedges’. A player places their leader at one wedge and on their side. All other unit and character cards are placed in one of these columns. Some cards give you ‘resource’. You can ‘tire’ the card by turning it through ninety degrees to use the resource it can give you. Most cards have a cost to deploy them. If you cannot generate sufficient resources from ‘tiring’ cards, you can discards cards from your hand to make-up the shortfall. You can also ‘tire’ a card to make use of its attack strength, called ‘might’ or zeal. Some cards have ‘actions’ that they can perform as well as provide a ‘resource’. Once ‘tired’ they cannot be used until they are reset at the start of the next round. 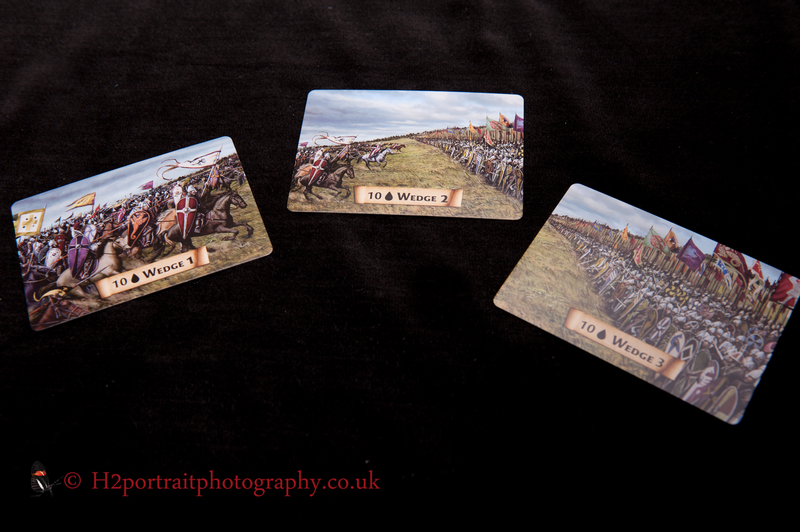 The three cards – wedges, that form the battle lines. Players have an objective desk that they must work through. Both of them start with the appearance of Halley’s comet and end with the Battle of Hastings. Players have to generate either might or zeal to complete the mission. They have to exceed the number on the card. If they do, any surplus ‘damages’ the mission. When six damage has been dealt, it is discarded at the end of the round and new one is revealed. Repeat this until you reach the Battle of Hastings mission. When you arrive, you can start attacking the three different wedges. 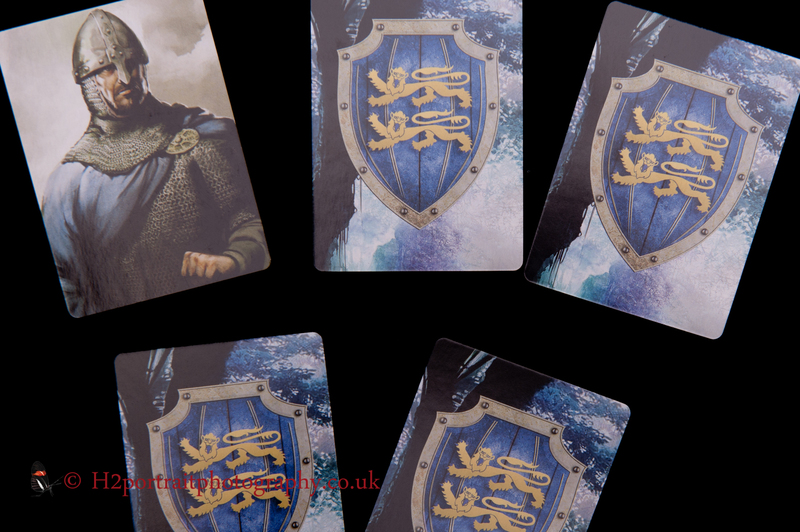 You will win the game if you destroy two of them, kill your opponent’s leader (William or Harold) or they run out of cards to draw. You win wedges by attacking them with either might or zeal. When you have inflicted ten damage to a wedge you win it and it is removed. If your enemy has troops on the other side of the wedge and they are not yet at the Battle of Hastings mission, they can only delay you by using their respective value to fight back. If the attacking player exceeds the defending value of their opponent, the difference is the amount of damage inflicted on the wedge. If not no damage is done by either player. If both parties are at the Battle of Hastings the one with the most might or zeal inflicts damage to the wedge. Attacking or defending a wedge will also tire your troops along that column. The main decks, damage and bonus tokens. The box is unnecessarily big. Having gorgeous and eye catching art is always a bonus for me. It will make me stop, look and investigate. It made me do exactly that with ‘Gloom of Kilforth’ (I have yet to play this game). 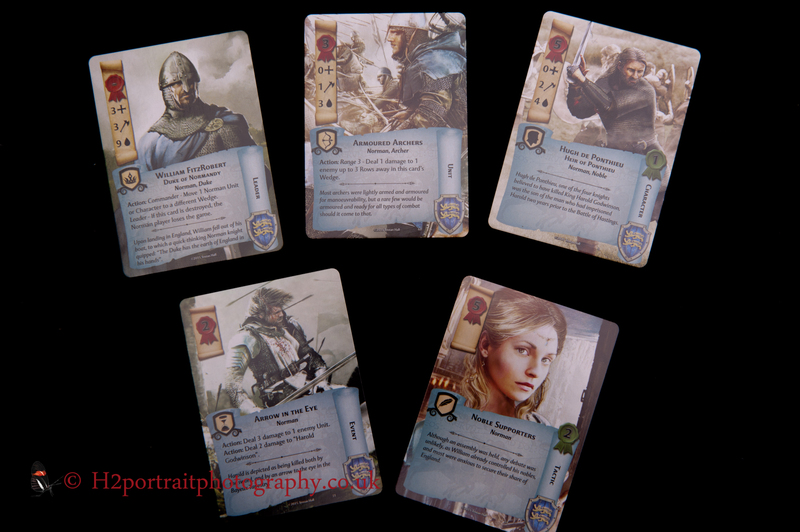 The card quality and tokens are good and of a decent quality. The box itself is above par except it is about a third too big for my liking. Yes, it looks good on a shop shelf, but it takes up precious space on my or in my bag. You could buy a duel deck box and put all the necessary pieces in that. Sure, it will not look as attractive, but it easier to store and carry around. This is a card game and we fill focus on those. Beyond the amazing art, the graphic design raises concerns for me. Most of it is fine, but the text is a bit small for my liking especially on the cards that allow you to reduce the cost of fielding another one. They have a red seal and ribbon with a number on it. This number is really small and hard to read if your eyesight is not brilliant. If the flavour text were removed, these could have been made much larger. The mission cards for William. The green seal and ribbon that denotes the card generates a resource when it is ‘tired’ is on the right-hand side of the card and you can miss it unless you examine each card carefully when it is in your hand. Some of the art is repeated on other cards that do not have identical powers e.g. one can be unit and another an event. This can be confusing at first especially if you are not expecting it. The rulebook is well laid-out with lots of pictures and clear explanations. A few more examples would have been helpful, but perhaps it is just me being thick? The card quality is decent and spot on. There is no issue with peeling or foxing. The colours are bright and vibrant on most of the cards. The damage tokens are made of wood and the other tokens from thick card. Cards from the Norman deck. You can see the green rosette on the far right cards. These provide you with one ‘resouce’ if you ‘tire’ them during a round. The mechanisms in this game work fine. I like the three-by-three grid. 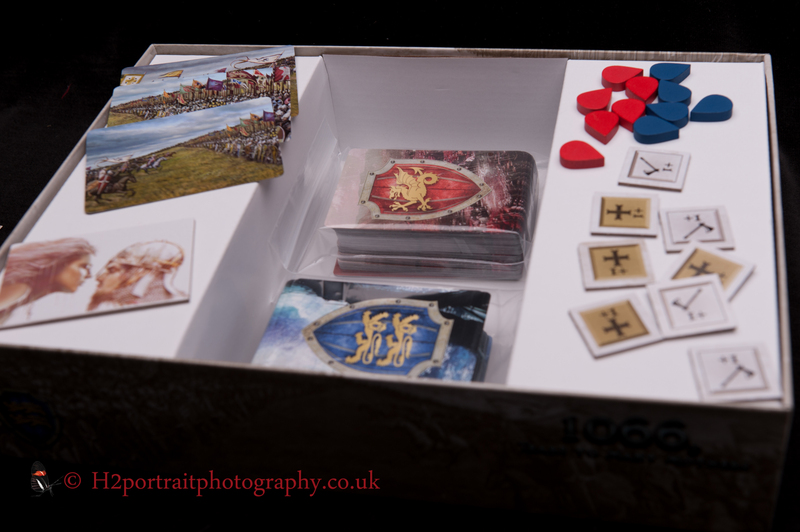 It stops you from overwhelming your opponent by stacking all your units on one wedge or swamping the board. Discarding as a resource is nothing new, but it works well in this game. You are faced with a number of difficult decisions every turn. It is pretty much impossible to play or keep all of the cards you want because some of them will have to be discarded to pay for others. Your hand size is also limited too, so it is hard to store up cards just to bring the big hitters into play. One inherent weakness in these kind of card games that have predetermined pack of cards, is a bad shuffle can really be a pain. If the cards you need are at the bottom of the deck, you are stuffed and there is nothing you can do about it. Remember, if you run out of cards, you lose! This can be mitigated a bit if the game is really short, all over in about fifteen to twenty minutes, but this one does take much longer. If you fall behind early on, it is doubtful that you will be able to catch up. It is not much fun continuing on for another half hour with a game when you know you are going to lose. You want at least a chance to fight back. The rulebook gives you optional rules. One of them is to draw three at the start of a round and discard one. Play with this rule, it helps you access the cards you need by moving through the deck at a faster rate. There are plenty of ways to hinder your opponent during the game long before you arrive at Hastings and three ways to win. There can be a lot of back and forth as you sabotage your opponents war machine whilst trying to build-up your own. Many of the cards can be use in multiple ways. Do you ‘tire’ it to generate a resource or zeal? Even the order can matter because your opponent may remove one of your cards just before you are about to utilise! I like that cards can be used in more than one way. Oh, another point, the decks are not just adapted mirror images of each other. There are cards that are, but there are substantial differences too. I do like games with asymmetric sides. 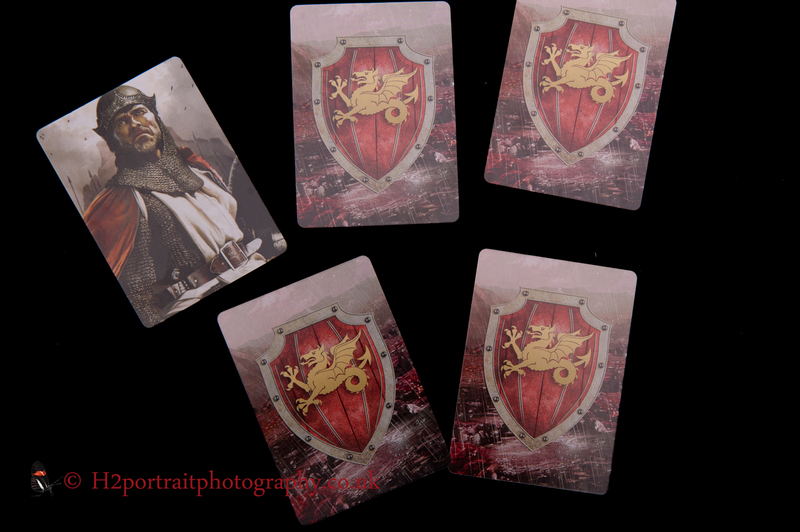 The backs of the Norman cards. I do like a game with a strong theme and this one has it in spades. It is both its strength and weakness. I love that it has a historical theme and one that is very rare. The characters were out of the Doomsday book and not fictional. It is something that we know about if we know our Anglo/French history. If your understanding is a bit ropey, this game may inspire you to look into what happened and the consequences of William’s victory that day. One of the cards has a character from Rouen and I have friend who grew up there. I have also been to a retreat not far from Battle itself. For me, there is a real connection to the theme of this game. There is one part where the theme breaks down. If you have archers or crossbowmen out, you can kill or wound your opponent’s units or characters. There are other characters or unit who can remove opponents from the field. This emulates attrition through disease, exhaustion and desertion, but it is a little tenuous. Players can (prior to the game) agree to fore go ranged attacks until they arrive at the Battle. Theme also prolongs this game and that can be detrimental (see the mechanism section above). There is only a certain number of times you can play this game before it will feel a little stale. Yes, the way the cards come out will be different every time and there are over seventy cards. But, you cannot change or customise the decks in anyway. Therefore, I can see this game can become very familiar after a time especially if you play against the same person. It is not like you can have a different set of missions along the way without deviating from the theme. Other games of this type will have different factions with their own special abilities or powers. This would ramp up the replayability, but because of the strong theme you cannot do this. This is the trade-off. 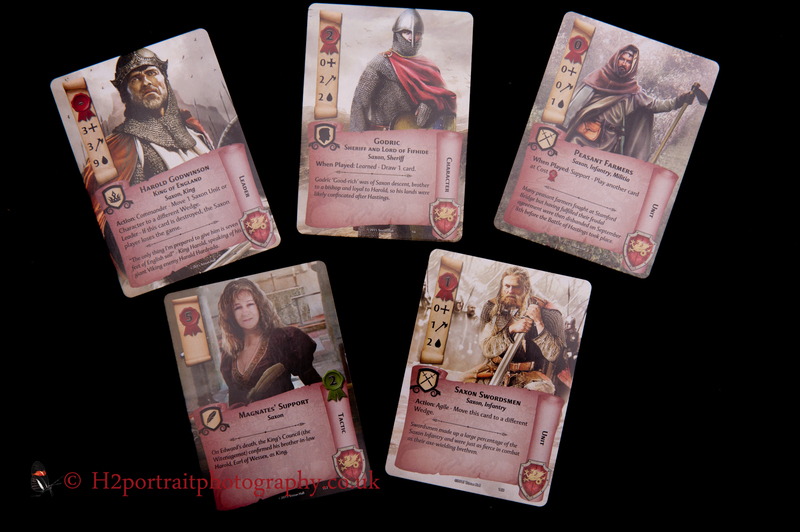 Cards from the Saxon deck. The way the game plays is very smooth. The core mechanisms are simple and sound. There is nothing so abstract that it is hard to understand. There are some real strategic decisions to be made from when you first draw your cards (and discard one if you are playing this rule), to the order that you ‘tire’ your people and what they will do for you. This game is essentially a race with a big fight at the end. You are trying to throw as many spanners into your opponent’s engine whilst improving yours. But do not grow too fond of it, because you will soon losing troops either because of your opponent or through completing a mission that causes you to discard one. Sometimes you will play a zero cost card knowing that they will sacrified pretty soon. They will play no role in your longer term strategy. Although some who have played this game, as part of the reviewing process, said they do not like game/not wish to play it again, I would say I did enjoy playing it and would. One of the issues of this game (mentioned earlier) is if you fall far behind your opponent during the game, it is hard to catch up. The backs of the Saxon deck. For two decks of cards and a number of components, this game is priced about right. I just wonder if it has the legs to mean you will play this game time and time again? If you like the historic nature of it, I would assume yes, I doubt this is the majority of us. When I consider what others have said and the my own experiences of this game, the overall consensus is mixed. It is a solid game, but it has not grabbed the interest of any of those who have played it. Saying that, my own personal opinion is this is a likeable game with some solid mechanisms. It flows well and the theme is excellent. I can see this game appealing to many people. It is not a war game, more of a resource management one with a big confrontation at the end. The main resource is the deck itself. In my opinion, the game is more about the journey and the trials you overcome to reach Hastings than the final battle. I am a huge fan of player verse player games. I own a few of them and play some of them a lot. If I did not own so many, I would probably like this game more. But because I am a bit spoilt for choice, I would choose another one of my games over this one hence why this would not be an auto buy for me. 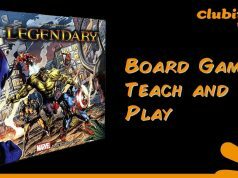 But, watch our teach and play video of the game and make your mind up for yourself. It is definitely worth a look at and a go if you do not mind the conflictive nature of this game. If you have any questions please leave them in the comments below or have you played this game? Please let other people know what you thought of it.